Many of my computers and most of my gas turbines came from scrapyards. I like nothing better than exploring aviation, military, and computer specialised scrapyards, junkyards, and breakers. 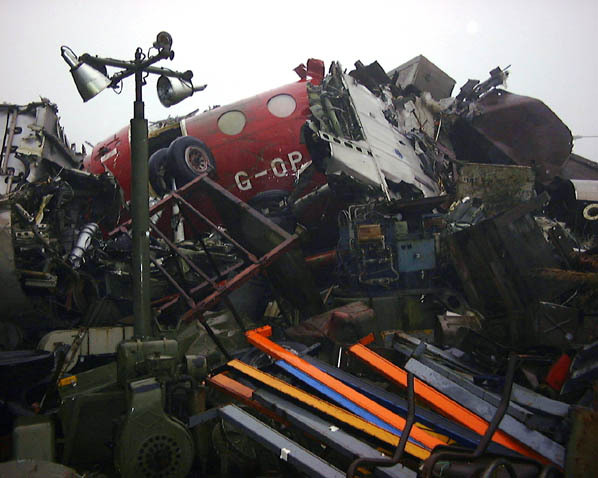 Some of my favourite British scrapyards are presented here. 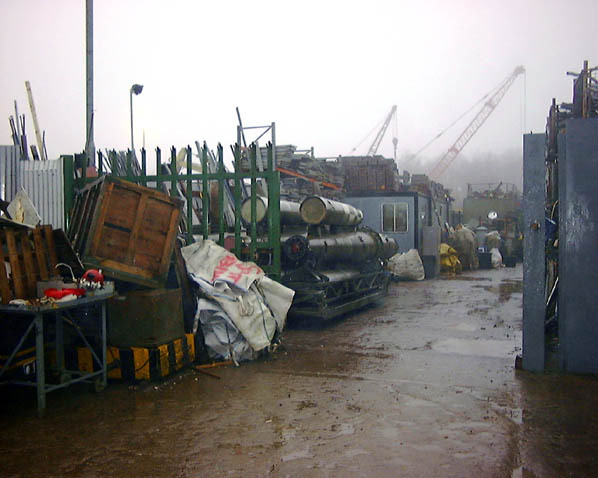 This is a general scrapyard, but due to its proximity to the RAF base at Kinloss, it got a large amount of military aircraft scrap. When I was there five years ago they had two big yards, literally piled high with aircraft - Buccaneers, Shackleton bits, missile and engine parts, even a Nimrod simulator! I returned late in '99 to find their main yard... was now a supermarket car park. Their 'other' yard, further out of town, had been totally remodeled and rebuilt, and 95% of the aircraft scrap was gone. Melted. All that was left were a few Derwent runway cleaners, pictured to the left. There may be a renaissance, but their best days are behind them I fear. The gate. Couple of big old 'Bloodhound' missiles on the left. Various aircraft at various stages of breaking. Canberra nose section still intact. Hanningfield metals is near Chelmsford, on the Chelmsford-Billericay road, on the left just a few hundred yards south of the A12 flyover - an industrial estate. 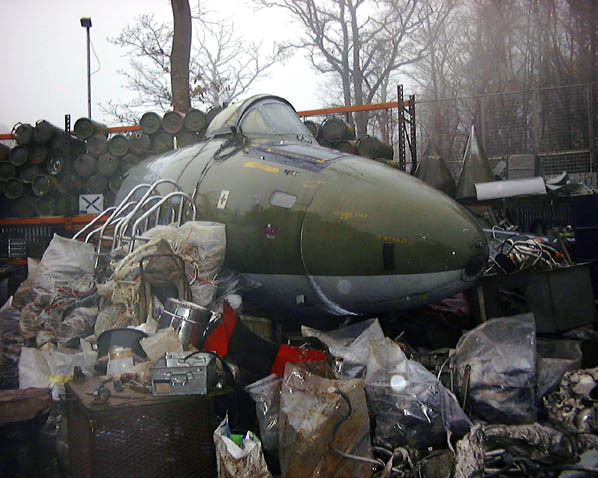 Has more general military surplus-type junk, but at times has had high piles of scrap airframes - haven't been there since 2000 or so, so unsure of current state of play. 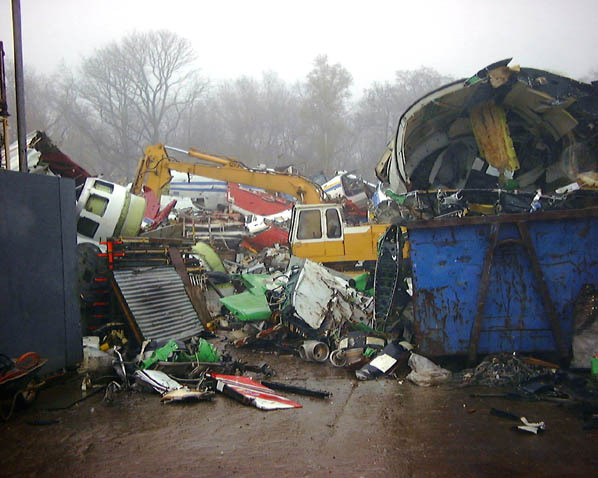 Roger Windley's scrapyard, near Tattershall Lincs. Visitors are positively NOT welcome - I was welcome enough on my first visit, by my second visit things had changed! This guy had a lot of stuff about 103 - site now closed but I've linked to archive.org. Nev Martin - Phoenix Aviation, Bruntingthorpe - a museum as much as a scrapyard! Taken circa. 1993, various dismantled Phantoms and JPs around in background. Foreground various engines - Paloustes, Continental units from M1A1 starting carts, and a bunch of Vipers. * update - Marine Salvage in Portsmouth are no more. They were an outfit that specialised in breaking up large jet engines for scrap - last time I was there, in 1998 or so, they were piled high with Avons. Owner retired and they shut up shop around 2000. Smiths of Bloxham (near Oxford) are a general scrapyard, but certainly used to get a good share of interesting computer equipment - don't know if they still do, but when I was going there in the 1990s they got all scrap from GCHQ (UK equivalent of the NSA!) - some *very* interesting stuff turned up there!